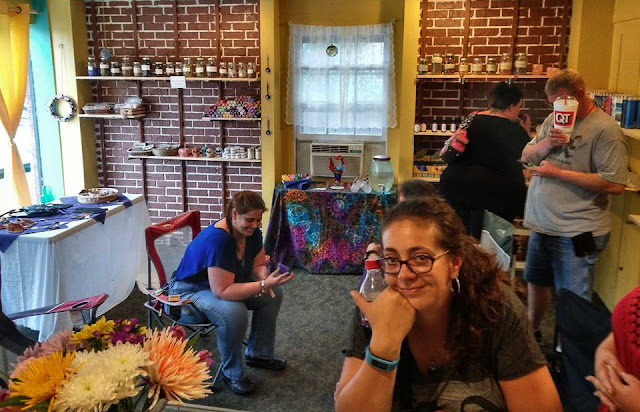 Last Tuesday, local conjure, rootwork and metaphysical store Mojo Mama's hosted Heart of the Bear Grove's ritual for the July full moon. Mojo Mama's opened just this April by KC pagan community member Angela, affectionately known as Mama Bear. 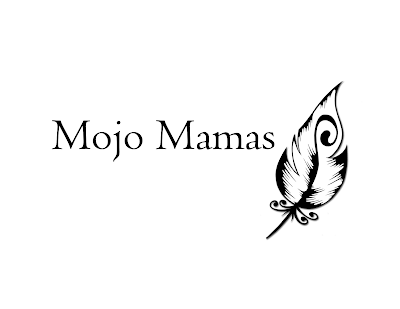 Nestled in historic downtown Independence, MO, Mojo Mama's specializes in components of spell work for all types of witchcraft and paganism, but with a emphasis on conjure and rootwork - Mama Bear's chosen path. The shop has quickly become a community favorite, particularly because it carries supplies handmade right here in Kansas City. The shop also has an extensive calendar of events, including Mama Bear's grove, Heart of the Bear Grove. You may remember way back in February that I mentioned talking an Advanced Spellwork course with three other of my circlemates from CF. Those who weren't in CF found such a strong bond through that class that they created Heart of the Bear Grove. Their first public ritual was for KCWMU back on Ostara. 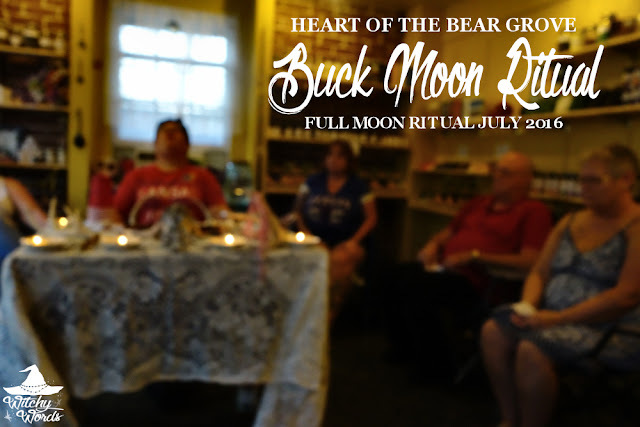 Now that Mama Bear has a designated space, Heart of the Bear Grove has the opportunity to offer more events, including full moon rituals! Entering the shop on Tuesday evening for the full moon ritual, I immediately noticed an altar set up in the middle of the shop. Given how hot the day was, the grove opted for an indoor ritual. Good thing too, as the heat index topped out at a whopping 103F. To ensure enough space for the number of community members who came, the grove set up directional candles on the altar instead of having separate altars that might take up standing room. This gave the attendants the perfect amount of room. ... And fire with incense (air) to create cleansing and sacred smoke. We were then asked to surround the room with white protective light and, with an athame, the space was cast. The quarters were called upon by various members of the grove one by one. Upon the altar, directional candles were lit. A god and goddess were also called upon, completing the call for elements and deities. Once the circle was cast and deities were called, Mama Bear began the core of the ritual by describing the growth of a buck's antlers. While buck antler growth begins around March, they see see an explosion in growth through July, typically completing or nearly completing their antlers by the end of the month. During this time, the growth can be itchy, painful even, and the antlers become heavy. Mama Bear asked us to pass the antler around and feel its weight, and to keep this weight in mind as we sat down for a guided medication. During the guided medication, we became bucks growing our antlers. Walking through the forest, we rubbed those growing antlers on trees to shed the velvet and relieve the itch and pain of the growth. This process left broken branches in our wake. We soon climbed up a hill to a cliff. Our antlers, fully formed and clean, were now a magnificent crown on our head. Much like a buck growing antlers, personal growth requires the shedding bad habits to become our best selves. It may leave behind unchangeable damage, such as the broken twigs in the forest, but ultimately, shedding that velvet and those bad habits and necessary to move forward. On the cliff, we overlooked our herd and returned down the hill to rejoin them at the front. After the guided meditation, we were given red and white braided rope and asked to tie it onto our wrists as a reminder of the bad habits we were now ready to break. Cake and ale, in the form of apple juice and vanilla wafers, were then blessed and passed around the circle. Deities and elements were then released and the circle was closed. And with that, the public full moon ritual came to an end. Everyone who attended stayed to chat but, given our current housing situation, I had to head home. And so concludes the first public full moon ritual by Heart of the Bear Grove hosted by Mojo Mama's! As always, public ritual events like these are the pinnacle of community here in Kansas City, drawing pagans and witches from every walk of life together as one. Likewise, I hope you enjoyed this ritual review! If you'd like me to continue covering Heart of the Bear Grove's public full moon rituals, just let me know in the comment section below. I hope everyone had a wonderful full moon! Talk to you soon!